MIP Junior Conference 2015 (an Expo dedicated to all-things children’s media in Europe) is happening right now in Cannes, France. One of the highlights of the show is Hasbro executive vice president and chief content officer Stephen Davis delivering a Keynote speech on the company’s transformation into a 360-degree entertainment provider. Of course Hasbro was at the show floor advertising their upcoming shows. 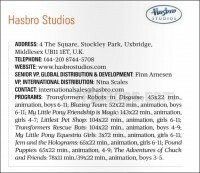 A friend of TFW2005 picked up a brochure highlighting the number of episodes planned for various animated shows and among them was Transformers Robots In Disguise. He also brought us some info to be shared with the 2005 Board Members. The episode count for the show is noted as 45; making the Second Season of the show just 19 Episodes. Prior to the 1st season of the show, it was announced that the show is planned for three seasons with 26 episodes each. However, based on the new info Season 2 is seven episodes shorter than what was originally planned and Season 3 seemingly omitted. List of episodes for Transformers: Rescue Bots is 104 within 4 Seasons (26 Episodes each). A trailer for Transformers: Robots In Disguise was also shown, but it contains footage from the first season with a new narrator reading a summary of the 1st season. TF: RID trailer shown at MIP Junior Conference 2015 has referred the Decepticons of the show not as Decepticons but as “A new faction of Decepticons”. There is plenty more to be shared. We will bring you more news from the Conference Floor, pretty soon. Until then, check out a scan of the brochure and other details, after the jump. 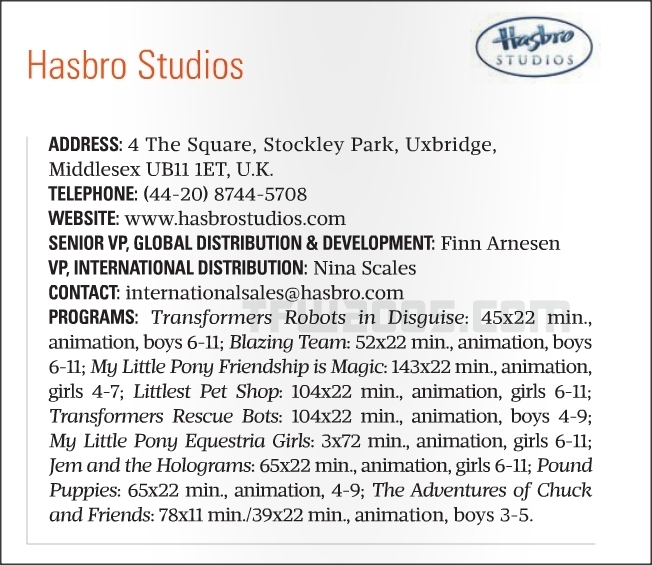 List of episodes for Hasbro’s super hit animated series My Little Pony: Friendship Is Magic is 143, which makes sense since at the end of Season 5 (currently broadcasted) the episode count is 117 and Season 6 is planned with another 26 episodes. 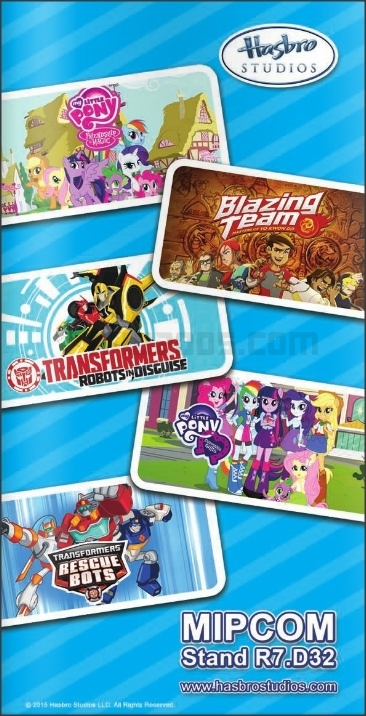 All new series titled Blazing Team (bunch of kids saving the world using martial arts… and Yo-Yos) is planned with 52 episodes spanning 2 seasons, Littlest Pet Shop is green-lit for a 4th Season with 26 episodes, Jem And The Holograms is not a new series but rather a re-broadcast of original 65 episodes to promote the upcoming Jon Chu live action movie. Strangely, Transformers: Robots In Disguise is getting the least amount of episodes when comparing with other Hasbro Studio shows. First Animated, then Prime, and now RiD. It's a pity you Transformers Cartoons cancel so easily, or I might have a sense of satisfaction now. Nope. The 2020 plan was dropped after the Aligned Continuity Team was disbanded, iirc. EDIT: Also I'm with Repainted on the notion that a shorter second season somehow equals canned show is ridiculous. With Prime, it was an official message from Hasbro that Season 3 would be a half season, and signal the end of TFP. We've gotten no word yet of anything like that with RiD2015. 19 episodes is well over a half-season, and there's been no indication the show would be done or Hasbro would've likely said that well in advance, potentially when announcing the episode count. But they didn't. Plus, shows are usually worked out a season at a time, not all the potential episodes at once. We could still get three seasons of RiD, but we only know the total episode count for the first two. Let's not doomsay quite so fast on this one. I came into RID cautiously optimistic that the show would be a worthy successor to Prime but also knowing that it had very big shows to fill. We knew that it was going to be more kid-friendly, but so is the modern iteration of TMNT and I love that show, but is RID TMNT? Unfortunately I'd have to say it's not. It's a decent show, but more often than not I end up walking away from most episodes feeling like they never needed to happen. The shows where something interesting happens (like Fixit displaying major fire power or the introduction of Kickback as a Dragster) are rare, but when they do the show really starts to kick in. I just wish there were more memorable moments. Add to this the fact that the animation is just not anywhere near as good as Prime. Prime had majesty in its incredible visuals and felt like an event- a feast for the eyes and the senses- whereas RID feels like something you barely pay attention to while focused on other things in the room. In other words RID is a very sad follow up to Prime in just about every way. It does have some bright spots though, like the excellent villain cast, but with the villain of the week format you barely have time to get under the hood (pardon the pun) of some of the better characters before they are shelved most likely never to be seen again. And don't even get me started on the hero heavy toy assortment, with some of the best villains only having a 1-step (I'm sadly looking right at you Thunderhoof) while other characters like Fixit have two already! Ultimately if this series goes away after 2 seasons I don't feel like I'm going to be too sad. Yes even if this means TF in toon format goes on hiatus until they can get a better show on the docket. Agreed and there's probably hope for a third season if they want to syndicate the series. Yes. His name is Will Friedle. I think he's the best voice actor for Bee we've ever gotten. What insider source? Namedropping without proof in an internet argument is quite silly. I don't think there's a really good indicator the show is cancelled. A shortened season means nothing. It could be 19 episodes followed by a 3 episode movie event (ala Prime's "Predacons Rising) thus making it actually 22. 22 episodes is still pretty close to a full season for a lot of shows. Some shows take on reduced episode counts for future seasons out of budget concerns, ideas utilized, etc like the current TMNT on Nickelodeon. It starting with 3 seasons of 26 episodes each and 2 more seasons to come with only 20 each. Until I hear differently, RiD15 still has a future. On a side note, how great is it the seldom discussed, Decepticon free series of Rescue Bots will surpass G1 in episode count? I think it's a great achievement by a well written, often under appreciated aspect of the Transformers franchise. I hope they get a send off event like a TV film. Exactly. Seeing as how the episode counts listed for all of the shows are about how many episodes there are thus far (the episodes aired and the episodes in production/part of a planned season), I'm not exactly seeing this as the death kneel of NuRID yet. But if it is getting canned, well, this wouldn't have happened if CN hadn't decided to waste half of their daily time slots on Teen Titans Go. Why does it have to be some kind of conspiracy reason for the show's failure? Who said it's Bay's or Cartoon Network's fault? What would CN even be able to do since they don't even produce the show themselves? Is it not more logical that the show simply failed to get good ratings and failed to move toys? Oh, it didn't exactly get good ratings, but this is Cartoon Network we're talking about. If anything, they'd probably kill this and other shows because TTG doesn't have enough airspace in their eyes. if we are going to be positive maybe is the end of RiD but the beginning of a new series sequel of RiD, like the end of TFP was the beginning of RiD. I don't think that RiD is going bad, remember we are not the 100% of the consumer and the demographic of the show. Yes, it will be better if all the Transformers media have the support of all the fans but with this fandom we know that not going to happen. or maybe they change their minds when season 2 aired, don't know. but really Hasbro haves to take more decepticons in his toyline! I'm happy with my Bees but I need my Thunderhoof and Vertebreak toys! Poor RiD… hasn't gotten a break since inception. RID was Dead on Arrival. I really don't think that's what they're planning. I've heard from inside sources, the show is really not doing so well. Even though Rescue Bots is an alright show…I'm mad it's the longest lasting one. I wish we could get a mainline show that has at least over a hundred episodes. If they decide to create another series let it be directed at all ages or create 2 separate series one that address younger audiences while the other one address the older ages. I get the fact they wanted to introduce new audiences to Transformers but do it in a way that pleases both sides. Have they announced any plans for a new series? I thought was the whole reason for Rescue Bots, but I guess Hasbro needs two shows to court the little ones. I'd really like to know how Hasbro surveys the younger demographics, as my son loved TFP–he likes the new show too, but misses TFP. At least I have Grimmlock's fan movie sequel to TFP to look forward to. The premise of RID being a loose sequel to Prime was good. And the prison ship crashing on earth with Bumblebee having to step up as a leader, etc -all good. The thing that killed it was it being aimed at very young children and silly/comedic. If it'd been executed in a more serious way, it could of been great. Some of the character designs were fantastic. While others were very cartoony and didn't seem to look like they fit at all.